StoryWeaver’s exciting foray into the East. 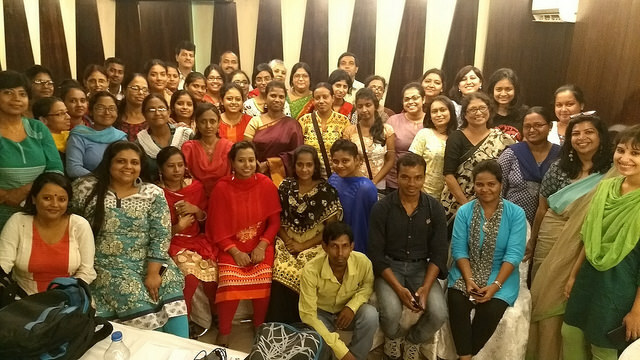 The Outreach team recently made a big leap towards reaching children in West Bengal and Odisha through two workshops conducted in Kolkata and Bhubaneshwar. We prepped for the workshop, famous Kusum rolls in hand and Kolkata in turn rewarded us with a fantastic turnout. Around 60 participants joined us from 12+ organizations working with children across the education and social sector. People had traveled from Asansol, Purulia, Bardhaman,Chandipur and even Jamshedpur for the workshop! We were amazed by the level of engagement everyone brought to the table throughout the all-day session. One such organization which attended in large numbers was Vikramshila Education Resource Society which works on a range of projects from early childhood education to capacity building from Ladakh in the North to Andaman in the South. One of their team-members raised the point that in West Bengal, if you travel 20km in any direction, the dialect and vocabulary changes. This slipperiness of the language can make teaching and reading a real challenge. These very pertinent questions were echoed by many of the organizations in attendance. Fortunately we also had with us an example of a possible solution in the form of two gentlemen from Suchana. Suchana is a 10 year old community group, which works in Birbhum district of West Bengal towards the education of pre-school to class 10 children from Santal and Kora adivasi communities. Their teacher-translators have used the ‘Translate’ functionality of StoryWeaver to great effect to develop supplementary reading materials in Kora and Santali. Currently, 27 Kora books and 19 Santali books, both in Bengali script are on StoryWeaver; all this made possible by the Creative Commons license we follow. The ensuing discussion was another aspect of our workshops: to bring people doing such good work in different ways into the same space so that they can begin to talk to each other and find areas of synergy. We jumped into speaking about how Pratham Books came into being and how StoryWeaver was designed to spread the power of stories to all children, particularly those with limited means to access quality books. We delved into our repository of free content from flashcards and spotting books for early readers to our STEM and Life-Skills based books. The books can be used in a variety of ways: getting children to relate things in their science class to real life, using illustrations as speaking or writing prompts, and so on. We had with us storytellers, teachers, librarians, program managers and content heads. They all put their heads together to visualize how to adapt the LSRW (Listening - Speaking - Reading - Writing) framework and content on StoryWeaver to their programs. Kolkata being the city of adda, we got into a debate of course about what kind of content we can and cannot show our children. After a demo of how to translate and create your own stories on the platform, the participants got to work. We ended with different groups showcasing stories they had created on the platform during their work-time and we bid adieu with a group picture. On to Bhubaneshwar we went! We were greeted by the green, clean city with wide roads and took advantage of the day to plan for the workshop and also to fill our stomachs with ‘dalma’! The next morning at the workshop people began pouring in from diverse organizations like Patang and Nilachal Seva Pratisthan who work in rural areas on programs including literacy for children and employable skill-development training for young adults. A number of organizations working with tribal children and reading and literacy programs were also in attendance such as SELCO, American India Foundation and Bakul Foundation. All of us were gathered in the room with one mission - how do we get children of Odisha access to more books to read in languages they love and understand. The main challenge that came up during discussion was once again finding adequate content and stories that represented experiences children could actually relate to, in languages that they felt comfortable with. This was where we introduced the audience to our Adi Kahani series- a set of 10 books based on the culture of tribal communities in Odisha, with stories developed and illustrated by local writers and illustrators and published in local tribal languages. Participants curated and presented lists of stories based on themes they wanted to teach like using ‘Cube Cat Cone Cat’ to teach shapes and dimensions in Math. 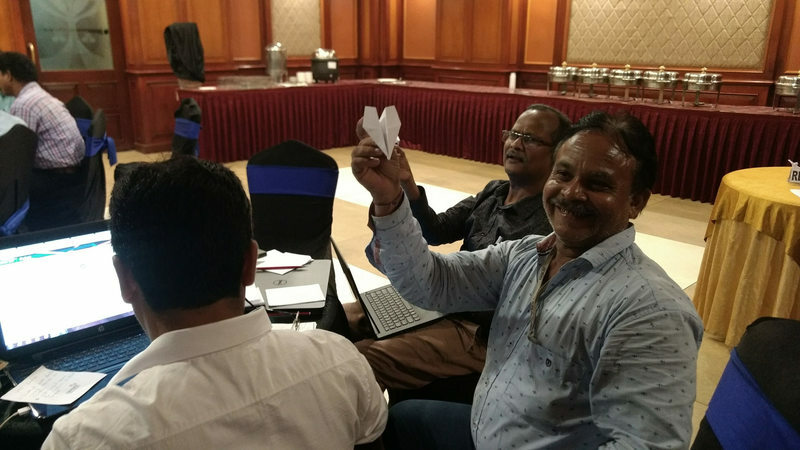 Some interesting directions were explored during the course of the workshop: Gram Tarang which is involved in skill training and also runs Tarang Vaani, an IVR radio was interested in recording some of our stories and airing them on radio to reach a wider audience! A team member from Sikshasandhan immediately expressed interest in collaborating to make this happen. The most lively time came during an ice breaker post lunch: we had to learn how to make paper planes out of the resource challenges we’d previously penned down, fly them across the room and pick up a different plane to see if there was any overlap in challenges faced. After all the plane throwing and giggling was over, we settled down into work-time where participants aired the sentiment of common resource challenge and shared the stories they’d translated into Odia and some new creations as well. 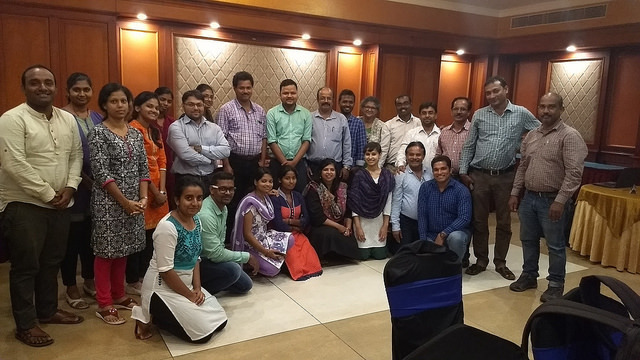 With a last hurrah and a group picture, we said goodbye to Bhubaneshwar. It had been a long, productive week and we were ready to go home and catch some well-deserved rest.